Third revised edition, loaded February 23, 2015. The honorable king [Nimi] said: 'My lords, please tell us about the illusory potency [or mâyâ, see also 11.2: 48] of the Supreme Lord Vishnu, we would like to understand that what bewilders even the great mystics. S'rî Antarîksha said: 'The Soul of All Living Beings evolved, by means of the elements of the greater creation, all creatures high and low [see B.G. 13: 22 & 14: 18], oh mighty armed one, so that they, the Original Person's own [parts and parcels], could be successful with [the choice between] the sense objects and the true self, the Soul [see also 10.87: 2]. The living being, that by the Supreme Soul was given a life with the modes, enjoys those modes and consequently takes this created body for the true self as also himself for the master and thus becomes entangled [see also B.G. 15: 8, compare 11.2: 37]. The proprietor of the body is because of the sense-motivated actions, driven by desires and engaged in different karmic - fruitive - activities from which he reaps the different fruits. And thus he moves through this world in both a state of happiness and the contrary thereof [see B.G. 2: 62]. This way by his karma reaching destinations that bring him a lot of things that are not so good, the living being till the end of time helplessly experiences birth and death. When the dissolution of the material elements is near the [Lord in the form of] Time that is Without a Beginning or an End, withdraws the manifest universe consisting of the gross objects and subtle modes [back] into the unmanifest [see also 3.29: 40-45, 3.26: 51]. There will be a terrible drought on earth that lasts for a hundred years, so that the three worlds during that period will be seriously scorched by the accumulated heat of the sun. Beginning from the lower regions [Pâtâla], the fire, with its flames fanned by the winds shooting upwards from the mouth of Sankarshana, will burn all directions. Great masses of samvartaka ['end time'] clouds will rain for a hundred years with torrents as long as elephant trunks, so that everything will be inundated. Oh King, the universe will thereupon, like a fire running out of fuel, be abandoned by the Personality of the Universal Form, as He [in the form of Brahmâ] enters the subtle reality of the unseen [pradhâna, see also B.G. 8: 19, 3.32: 12-15]. The earth, by the wind deprived of its aroma, changes [back] into water and the water by the same process [of the wind] being deprived of its taste, becomes fire [again, see *]. Fire, by darkness deprived of its [quality, its] form, turns into air and the air, losing its [quality of] touch, dissolves into the ether. When the sky [the ether], by the Supreme Soul of Time is deprived of its quality [of sound], it merges into the ego [of not-knowing]. 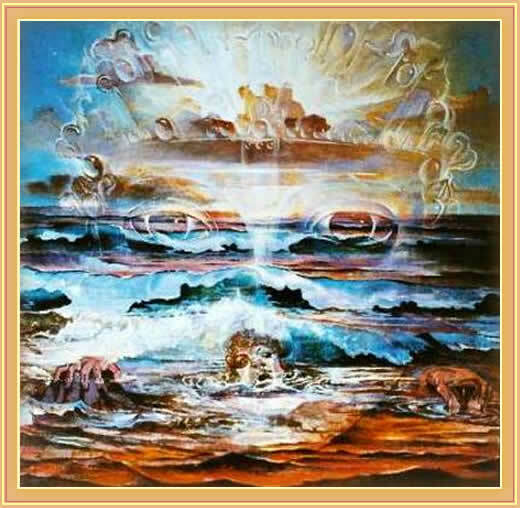 The senses, the mind and the intelligence oh King, merge together with the gods [representing the emotions] into the ego-element and the I-awareness merges together with all its guna-qualities into the Supreme Self [see also 3.6 and 3.26: 21-48]. S'rî Prabuddha said: 'One should see that people who live as husband and wife, with their endeavors to lessen the distress and to gain in happiness, achieve the opposite result. What happiness can one expect from the unsteadiness of having a home, children, relatives, domestic animals and the hard to acquire wealth which always gives distress, that mean death to the soul? Know that the idealized world for which one thus settles, is founded upon fruitive labor, cannot be sustained and is characterized by matters like a loss of behaving properly in groups of equals and with superiors [B.G. 8: 16]. Someone eager to know about the highest good, should therefore take shelter of a spiritual master who resides in the supreme tranquility of the Absolute Truth and is also well versed in the conclusions of the Vedas [see e.g. 5.5: 10-13, 7.11: 13, 7.12: 1-16, 7.15: 25-26, 10.86: 57 and B.G. 4: 34]. With the guru as one's soul and worshipable deity, one should learn the science of devotional service [the bhâgavata dharma or emancipation process, see 11.2: 34] by which, free from illusion being of faithful service, the Supreme Soul can be satisfied who bestows His own Self [**]. One should first of all detach the mind from everything and properly, with mercy, friendship and reverence for all living beings, cultivate association with devotees [compare 11.2: 46]. [That entails: inner and outer] cleanliness, penance, tolerance and silence, scriptural study, simplicity, celibacy, nonviolence and equanimity concerning the known opposites [see also yama & niyama and B.G. 12: 13-20]. In solitude, without [attachment to] a fixed residence, wearing old rags and satisfied with anything, one should with the Lord constantly kept in mind, meditate upon the omnipresent True Self [see also 2.2: 5, 7.13: 1-10]. With faith in the scriptures about the Supreme Lord and not blaspheming other scriptures, one should with respect for the truth and with one's mind, speech and activities strictly controlled, be innerly peaceful and master one's senses [see also B.G. 15: 15]. Hearing, chanting and meditating the incarnations, pastimes and qualities of the Lord whose activities are all wonderful, one must do everything for His sake. Whatever worship, charity, penance, japa or piety one performs, everything held dear, one's wife, sons, home and very life air, one should dedicate to the Supreme [see also B.G. 9: 27]. In rendering service to both [the moving and nonmoving living beings] one must be of friendship with the common man as also with the devotees, the great souls who accepted Krishna as the Lord of their heart. By the glories of the Lord one may find in mutual discussions, in being attracted to each other, in pleasing one another and in one's together putting an end to material activities, the purification of [one's relation with] the soul [see also B.G. 3: 38]. Remembering [Him] and reminding one another, the bhakti unto the Lord who puts an end to the chain of sins, because of that devotion leads to an awakening whereby the body responds with goose bumps [see also 11.2: 40]. Sometimes one cries by the thought of Acyuta, sometimes one laughs or takes great pleasure or speaks, acts wondrously, dances and sings and sometimes one, following the example of the Unborn One, is freed from distress and becomes silent while attaining the Supreme [see also 10.35]. S'rî Pippalâyana said: 'Oh King, know that the Supreme gives life, it is that on the basis of which the senses, the life air and the minds of the bodies of all living beings are moving. It constitutes the cause without cause of the creation, destruction and maintenance of this universe, that exists in the state of wakefulness, in the dream state and in the unconscious state as also external to these states [of consciousness]. This [Supreme Truth] cannot be covered by the mind, by the faculties of speech, sight, intelligence, the life air or by the senses, just as a fire cannot be covered by its own sparks. Not even the Vedic word may express it, for the Vedas deny that the Supreme Self can be expressed in words. It can only be achieved by indirect expressions, by words that refer to that without which there would be no ultimate purpose to the scriptural restrictions [compare 10.87]. In the beginning being One, it thereafter became known as the threefold of goodness, passion and ignorance [of the gunas] that is associated with the power to act and the power of consciousness of the I-awareness that one calls the individual living being [the jîva, the individual soul]. Assuming the forms of spiritual knowledge [the gods], actions [of the senses and their] objects and [good and bad] results it thus possesses a great variety of energies. It is the Supreme alone that [as the Absolute Truth or Brahman] is manifest beyond both the [relative of the] gross and the subtle [see also mahat-tattva, pradhâna, 4.29: 79, B.G. 10: 42, 13: 13 & 7: 14]. This Soul, never born and never dying, grows nor decays. It is the knower of the stages of life of the living beings that are subjected to change. That Soul, omnipresent and everlasting, which is pure consciousness, became many [jîvas], just as the [one] life air [prâna] by the power of the senses resulted in a variety [of vital forms, see also B.G. 2: 23-30 and ***]. [With beings that originated] from eggs, with embryos, with plants and with that what is difficult to discern in moisture [micro-organisms], the vital air accompanies the [same] individual soul [see also linga] from one [life form] to the other, just as the self, apart from the thought process invariably stays the same with a memory restoring when one awakens from a deep sleep in which the ego and the senses had merged [see B.G. 2: 22]. The honorable king said: 'Please explain to us the karma yoga by which a person being purified in this life quickly gets rid of his fruitive actions and, freed from karmic reactions, achieves the Supreme [see also B.G. 1-6 or 3.5]. S'rî Âvirhotra replied: 'Right action, non-action and wrong action [karma, akarma, vikarma] are Vedic subject matters, not a worldly subject and since Vedic knowledge comes from the Lord Himself, [even such great] enlightened souls [easily] get confused about this matter [see also B.G. 4: 16-17 and 4.29: 26-27]. Offering guidance to ignorant human beings, the Vedas in covert terms prescribe material activities [duties] to be freed from karma, the way one also prescribes a medicine [see also B.G. 3: 26, see 5.5: 17, 10.24: 17-18]. Someone ignorant who has not subdued his senses and fails to do what the Vedas say, will by his lack of dharma following a wrong course of action [vikarma], achieve death time and again [see also B.G. 3: 8, 16: 23-24, 17: 5-6, 18: 7]. When one according to what the Vedas prescribe without attachment performs and sacrifices for the sake of the Supreme Lord, one will certainly achieve the perfection that to raise interest is put in terms of fruitive results [karma-kânda and B.G. 4: 17-23]. Someone who quickly wants to cut the knot [of attachment] in the heart that binds the soul to the body, should, with [respect for] the regulative principles [the vidhi], worship Lord Kes'ava as also study the divine as described in the supplementary Vedic literatures [the tantras, see also B.G. 12: 6-7]. Having obtained the mercy [the initiation] of the teacher of example [the âcârya] who shows him what is handed down by tradition, the devotee should worship the Supreme Personality in the particular form he prefers [see also B.G. 3: 35, 7: 20]. Cleansed, sitting in front [of His idol], with a concentrated mind controlling his breath and such [see ashthânga-yoga] and purifying the body by invoking His protection in renunciation [by assigning the different parts of his body to Him by marking them with mantras], he should worship the Lord [see also B.G. 5: 27-28 and 6.8: 4-6]. With all available ingredients he [thereto] prepares himself in his heart and mind. He takes the deity and everything belonging to it as also the items to be offered and sprinkles the floor and the place to sit. He prepares the water for the sacrifice and attentively puts the deity in its proper place. He draws sacred marks on His heart and the other parts of His body. Next he is of worship with the appropriate mantra [4*]. With the mantras belonging to Him he should be of worship for each particular deity and its limbs, His special features [like His cakra] and His associates [like the pañca-tattva, see the S'is'umâra-mantra or the Ambaris'a prayers for the cakra mentioned in 5.23: 8 and 9.5]. Presenting the worship in every respect as it is enjoined with water for His feet, scented water to welcome, water for the mouth and for bathing and such, with clothing, ornaments, fragrances, necklaces, unbroken barleycorns [meant for applying tilaka] and with garlands, incense, lamps and such offerings, he should bow down to the Lord with reverence and prayer. Absorbing himself in that activity [as a servant and not falsely identifying himself] he should, thus meditating, fully be of worship for the mûrti of the Lord. Then, taking the remnants to his head [for acceptance], he should put Him respectfully back where He belongs. *: When a quality is removed, becomes an element nondifferent from the element that evolved earlier in the evolution of the universe, it then merges, changes, or dissolves into it. That is how the annihilation of the universe takes place. 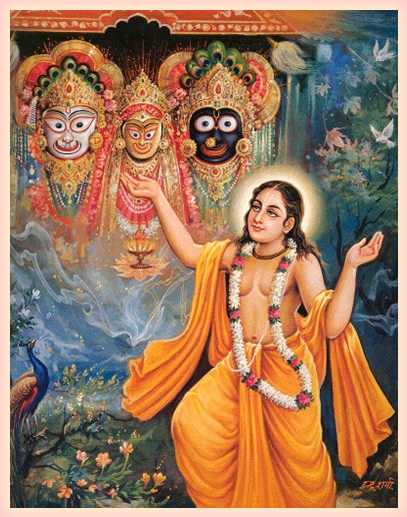 *4: Just as each prâkrita, impersonalist, materialistic devotee is worshiping the Lord as the deity of his preference in His form of Time with pragmatically perverted, unleaped clocks and week divisions [see the Order of Time and kâla for correcting on this] and with mantras like 'be on time' and 'time is money', so too does classical bhakti with the kanishthha or beginning personalist devotee, more faithful to the Vedic authority, worship the personal form of the Lord in the form of a [Krishna] deity while saying 'om namo bhagavate vâsudevâya' [4.8: 54], the Gâyatrî, the Mahâmantra and other mantras. In all these cases should be remembered what Vyâsa in 11.2: 47 says about mûrti-worship in general. Painting 'Time" is © Johannes Ptok.